Pediatric Acute Lung Injury (ALI) is associated with a high mortality and morbidity, and dysregulation of matrix metalloproteinases (MMPs) may play an important role in the pathogenesis and evolution of ALI. Here we examined MMP expression and activity in pediatric ALI compared with controls. MMP-8, -9, and to a lesser extent, MMP-2, -3, -11 and -12 were identified at higher levels in lung secretions of pediatric ALI patients compared with controls. Tissue Inhibitor of Matrix metalloproteinase-1 (TIMP-1), a natural inhibitor of MMPs was detected in most ALI samples, but MMP-9:TIMP-1 ratios were high relative to controls. In subjects who remained intubated for ≥10 days, MMP-9 activity decreased, with > 80% found in the latent form. In contrast, almost all MMP-8 detected at later disease course was constitutively active. Discriminating MMP-9:TIMP-1 ratios were found in those who had a prolonged ALI course. These results identify a specific repertoire of MMP isoforms in the lung secretions of pediatric ALI patients, and demonstrate inverse changes in MMPs -8 and -9 with protracted disease. Matrix metalloproteinases (MMPs) are involved in many normal homeostatic mechanisms. However, accumulating data suggests that MMP dysregulation can contribute to the pathology of chronic lung disorders, such as asthma (1-2), emphysema (3), chronic obstructive pulmonary disease (4), bronchopulmonary dysplasia (5-6) and cystic fibrosis (CF) (7-8). High levels of MMP-2, -8, and -9 have also been demonstrated in lung diseases with an acute onset, such as adult ALI and Acute Respiratory Distress Syndrome (ARDS) (9-12) and Respiratory Distress Syndrome (RDS) of the newborn (5). MMP isoform expression and activity in pediatric ALI, however, remains largely unknown. Unique aspects of MMP expression and activity might be predicted in this population relative to others, since the causes of pediatric ALI differ from those of acute respiratory failure in other age groups, with a strikingly higher incidence of viral lower respiratory tract disease leading to ALI in children compared to adults (13-14). Here we report MMP expression and activity profiles in pediatric ALI subjects compared with well pediatric controls, including examination of TIMP expression. We hypothesized that a unique MMP profile exists in lung secretions of pediatric ALI subjects, and that dysregulated MMP activity may play a role in the pathogenesis and evolution of this disease. We identified increased MMP-8 and -9 activities in pediatric ALI with corresponding expression of TIMP-1. In those with persistent disease, MMP-9 activity dropped later in the disease course relative to MMP-8 activity, which remained elevated. Our findings highlight important changes in MMP isoform expression and activity with disease state, and may identify novel disease biomarkers and potential targets for intervention. Lung secretions were collected via endotracheal suctioning from intubated pediatric patients with a known diagnosis of ALI within 24 hours of intubation, with serial samples collected approximately every 12 hours for the duration of intubation. Samples were collected with a suction cannula (8F-12F, depending on endotracheal tube size) inserted past the end of the endotracheal tube. All subjects were enrolled consecutively over a 1 year period. Approval from the Institutional Review Board at The University of Alabama at Birmingham and informed consent was obtained prior to sample collection. Exclusion criteria for the study included immunosuppresion (recent steroids or cytotoxic therapy), transplantation or failure to obtain study consent. ALI was defined as hypoxemia (ALI PaO2/FiO2 ≤ 300 mm Hg, ARDS PaO2/FiO1 ≤ 200), bilateral infiltrates on frontal chest radiograph, pulmonary artery occlusion pressure ≤ 18 mm Hg when measured, or no clinical evidence of left atrial hypertension (15). Virus-induced ALI was defined as ALI caused by any viral etiology as determined by a positive rapid viral screen (direct fluorescent antibody for RSV, adenovirus, influenza A or B or parainfluenza virus) or viral culture. Control subjects were pediatric patients with no known lung disease undergoing elective surgical procedures in the Operating Room (OR). All subjects screened for chronic lung disease prior to surgery were excluded from the study. Samples were obtained during the standard care of the endotracheal tube, which was typically performed in the earlier portions of the procedures. No patient identifiers were collected with these samples. Predominant diagnoses within the controls included elective tonsillectomies and/or adenoidectomies, with a median age of 4 years. 14 subjects were enrolled over a 3 month period. Once collected, endotracheal tube aspirates were centrifuged at 1000 RPM at 4ºC for 10 minutes. The supernatant was collected, protein concentration was measured as described by the manufacturer (Bio-Rad, Catalog # 5000112), and separate aliquots were saved at 4° C for immunoblotting and quantitative analysis as outlined below. All patient samples were electrophoresed on SDS-polyacrylamide gels (20 µg protein/ sample was loaded for each immunoblot lane) according to a modified method by Laemmli (16) and electroblotted onto Immobilon-P PVDF membranes. Membranes were blocked in Tris buffer (pH=7.4) containing 5% powdered milk for one hour, washed and incubated with primary antibody of interest overnight at 4°C. After incubation, samples were washed with borate saline (100 mM boric acid, 25 mM Na borate, 75 mM NaCl) and incubated with species-specific IgG horseradish peroxidase conjugates (at dilutions of 1:5000) for one hour. Immunoblots were then developed using ECL chemiluminescent kits (GE Healthcare, Piscataway, NJ). To measure total gelatinase activity, zymography was performed on all patient samples using a modification of a technique previously described (17). In brief, samples (10 ug protein/sample) were subjected to electrophoresis through 7.5% polyacrylamide gels containing 1 mg/ml porcine skin gelatin in the presence of SDS under non-reducing conditions. Following electrophoresis, gels were washed in 2.5% Triton X-100 for 1 hour at 4°C, then incubated in 50 mM TRIS, 5 mM CaCl2 for 16 hours at 37°C. Gels were stained for 30 minutes in Coomassie blue and destained for 1-2 hours. MMP-8, -9 and TIMP-1 activity were quantified using ELISA-based activity assays (F8M00, F9M00, DTM100; R and D systems, Minneapolis, MN). The manufacturer's sensitivity (minimum detectable concentration) for individual kits was 0.021 ng/ml for MMP-8, 0.005 ng/ml for MMP-9 and 0.08 ng/ml for TIMP-1. Briefly, samples and recombinant enzyme standards were incubated for two hours at room temperature in 96-well plates coated with monoclonal antibodies for MMP(s) (MAB 908 for MMP-8 and MAB 911 for MMP-9) of interest, followed by activation with 1 mM aminophenylmercuric acetate (APMA), a chemical activator of MMPs. After incubation for another two hours at 37°C, a fluorogenic substrate (Fluor-Pro-Leu-Gly-Leu-Ala-Arg-NH2) was placed in each well and the plate was incubated at 37°C for 18 hours. The plate was then read on a spectrophotometer (SpectraMax Gemini, Molecular Devices, Sunnyvale, CA; excitation and emission wavelength of 320 and 405, respectively) and data was quantified using standard curves provided with the kits. For the studies of TIMP-1, samples and recombinant TIMP-1 standards were incubated for two hours at room temperature in 96-well plates coated with TIMP-1 monoclonal antibodies. Bound TIMP-1 was then conjugated with a horseradish peroxidase-based secondary antibody for one hour. A colorimetric substrate (hydrogen peroxide and chromagen) was placed in each well and color change was quantified on a colorimeter (Bio-Rad, Hercules, CA) within 30 minutes via standard curves provided with the kits. The following primary monoclonal antibodies were used to immunoblot for the various MMPs and TIMPs of interest. MMP-8 (MAB 3316; Chemicon), MMP-9 (MAB 911; R/D Systems), MMP-2 (MAB 9022; R/D Systems), MMP-3 (MAB 905; R/D Systems), MMP-11 (MAB 3365; Chemicon), MMP-12 (MAB 919; R/D Systems), MMP-1 (MAB 901; R/D Systems), MMP-7 (MAB 9071; R/D Systems), MMP-10 (MAB 910; R/D Systems), MMP-19 (RP3MMP19; Triple Point Biologics, Inc, Forest Grove, OR), MMP-26 (RP2MMP26; Triple Point Biologics, Inc), MMP-27 (RP2MMP27; Triple Point Biologics, Inc), TIMP-1 (MAB 970; R/D Systems) and TIMP-2 (MAB 971; R/D Systems). All recombinant MMPs and TIMPs were purchased through either R and D Systems (Minneapolis, MN) or Chemicon (Temacula, CA). Descriptive statistics including mean and standard error of the mean (SEM) were determined for all continuous data. ANOVA, paired and unpaired t-tests were used for comparisons of MMP and TIMP activities utilizing Sigmastat statistical software (Jandel, CA). A p-value < 0.05 was used to determine statistical significance. As this was an exploratory study to examine MMP expression and activity in the study group relative to controls, no formal power calculations were performed in advance of sample collection. Table 1 provides a summary of demographic and diagnostic information regarding the pediatric ALI subjects. The diagnoses and ages of ALI subjects were typical for those normally cared for in this tertiary PICU. 68% of patients enrolled met criteria for ARDS, the most severe form of ALI. Global mortality was 16% while 44% of subjects had multi organ failure. †Prolonged ALI: ALI and ventilator days ≥ 10. Figure 1 provides a plot of the number of ALI subjects and their duration of intubation. Based on the inherently bimodal distribution of the data (for the purposes of our analysis), and the lack of consensus regarding definitions of early or late ALI (11, 18), subjects who were extubated before day 10 (N=13) were defined as 'short course' ALI, while those who were not were defined as 'prolonged ALI' (meeting ALI criteria and requiring intubation ≥10 days, N=12 subjects). The average number of intubated days for this group of patient was 17 versus 4 days in those with a 'short course' ALI (p < 0.0009). Thus, this natural breakpoint defined two patient groups with vastly different needs for ventilatory support. To define the MMP profile of all ALI subjects, lung secretions collected from days 0 to 10 of intubation for each subject were pooled and probed for MMP isoform expression by zymography and western blotting. Samples were pooled due to occasional inadequate sample volumes that limited longitudinal analysis. An example of gelatinase activity found in lung samples from one subject over time is shown in Figure 2A, demonstrating a rapid increase and progression over days 0-4 of disease. MMP-8 and MMP-9 were identified in the majority of ALI samples (Figures 2B and 2C), with lower levels of MMP-2, -3, -11 and -12 detected in some ALI samples (data not shown). Other MMPs screened but not detected included MMPs -1,-7,-10,-19,-26 and -27. Lung secretions were also probed for expression of natural MMP inhibitors TIMP-1, and -2. Only TIMP-1 was detected in the majority of ALI samples, while antibodies to TIMP-2 failed to identify this inhibitor in screened samples. 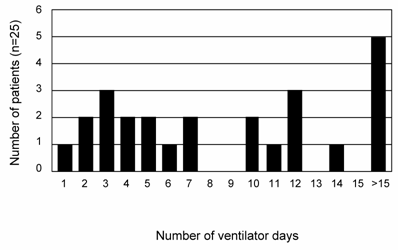 Number of ventilator days for each ALI subject (N=25). 12 ALI patients went on to have a protracted course, requiring ventilatory support for ≥ 10 days. The mean number of intubated days for this subgroup was 17±3.3 days, compared to 4±0.6 days for the rest of the ALI subjects (Mean±SEM; p< 0.0009). Based on the results of our screening summarized in Figure 2, we examined the activities of MMP-8 and MMP-9 in all ALI subjects (N=25, days 0-10) compared to controls. Active MMP-8 was up-regulated in ALI subjects, with an approximately 7-fold increase compared to controls (Figure 3A, p < 0.004). Total MMP-8 activity, determined post APMA stimulation of latent MMP-8 was elevated approximately 3.5-fold (Figure 3B, p < 0.04). Figure 4 summarizes mean active and total (including detection of latent MMP-9 by APMA stimulation) MMP-9 activity in ALI samples, demonstrating that both active and total MMP-9 activity was up-regulated (approximately 3-fold higher when compared with control values, p < 0.0003). Because viral respiratory infections are a common cause of bronchiolitis and pneumonia that lead to ALI in the pediatric population, we examined MMP-8 and MMP-9 activities in virus-induced ALI compared with non-viral ALI. We found insignificant elevations in total MMP-8 and 9 activities in subjects with viral ALI (RSV=4, Parainfluenza=2) compared to non-viral ALI subjects (viral ALI MMP-8=49±22 ng/mg, non-viral ALI MMP-8=24±9 ng/mg; p≈ 0.3; viral ALI MMP-9=582 ± 300 ng/mg, non-viral ALI MMP-9=402±57 ng/mg; p≈ 0.4). Expression of MMP-8 and MMP-9 in pediatric ALI. For 2B-2C, each lane represents lower airway secretions from a separate ALI subject. '+' represents recombinant MMP of interest as positive control. 2A. Zymogram (7.5% SDS non-reduced gel) demonstrates increasing gelatinase activity in lung samples from one ALI subject over time. Each lane represents a sample obtained every 12 hrs from time of intubation to Day 4. 2B. 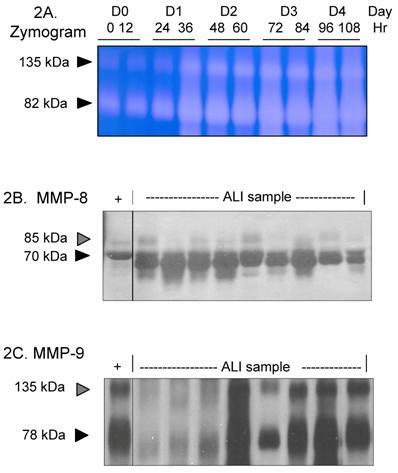 Western blot (7.5% SDS reduced gel) demonstrates prominent MMP-8 staining (70 kDa, black arrow) in ALI samples. The faint higher molecular weight bands at ~85kDa (grey arrow) likely represent pro-MMP-8 isoforms. 2C. Western blot (7.5% SDS non-reduced gel) shows prominent MMP-9 staining (78 kDa, black arrow) in ALI samples. The higher molecular weight band at 135 kDa (grey arrow) is consistent with lipocalin:MMP-9 complexes. Since TIMP-1 normally provides negative regulation to MMP-9 in tissue compartments, we examined TIMP-1 activity and MMP-9:TIMP-1 activity ratios in our ALI samples (all subjects, N=25, days 0-10) compared with controls. Although TIMP-1 was detectable in the lung secretions of most ALI subjects, there was no significant difference in activity between ALI and control subjects (ALI=137±19 ng/mg, control=109±13 ng/mg; p≈ 0.4), leading to a higher MMP-9:TIMP-1 activity ratios in the ALI samples compared to controls (Figure 5, p < 0.006). We then examined these parameters in subjects who went on to have a prolonged course of ALI (ventilatory support for ≥10 days, N=12). MMP-9 and MMP-9:TIMP-1 activity ratios in 'short course' ALI (N=13 subjects, samples from days 0-10) were higher than those in complimentary samples from the 'prolonged ALI' subjects (N=12 subjects, samples from days 0-10) (Table 2). Thus, high MMP-9:TIMP-1 activity ratios during days 0-10 correlated with subjects who exhibited more rapid disease resolution within our study population. Mean (±SEM) MMP-8 activity in ALI subjects (N=25) relative to controls (N=14). Total MMP-8 level was measured following chemical stimulation of samples with APMA (1 mM) to activate latent MMP-8. 3A. Active MMP-8 is up-regulated in lung secretions of ALI subjects compared to controls (ALI=33±8.9 ng/mg, control=4.7±1 ng/mg; * p < 0.004). 3B. Total MMP-8 activity is higher in lung secretions of ALI subjects compared to controls (ALI=61±20 ng/mg, control=17±3 ng/mg; * p < 0.04). Mean (±SEM) MMP-9 activity in ALI subjects relative to controls. Total MMP-9 level was measured following chemical stimulation of samples with APMA (1 mM) to activate latent MMP-9. 4A. Active MMP-9 is up-regulated in ALI lung secretions compared to controls (ALI= 490±85 ng/mg, control=147± 39 ng/mg; * p < 0.0005). 4B. Total MMP-9 is up-regulated in ALI lung secretions compared to controls (ALI= 668±88 ng/mg, control=230± 63 ng/mg; * p < 0.0003). Mean MMP-9:TIMP-1 activity ratio in ALI subjects was approximately 8-fold higher when compared to controls (* p < 0.006). We next analyzed MMP-8 and MMP-9 activity in the subgroup of subjects with a prolonged course of ALI (N=12). For these studies, MMP activities in pooled samples from days 0-10 and ≥ 10 days were compared for each subject. 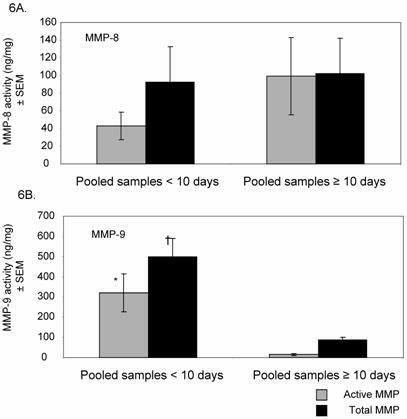 Active MMP 8 and -9 (ie: endogenous levels at baseline, prior to chemical stimulation with APMA) and total MMP levels (post-APMA stimulation, which activates latent MMPs present in samples) are shown (Figures 6A and 6B). Total MMP-8 remained high with ALI persistence, with almost 97% detected in the active form. In contrast, MMP-9 levels dropped after day 10 of intubation, with most activity seen post-APMA stimulation, reflecting the predominant presence of pro-MMP-9 isoforms. Active and total MMP-8 and MMP-9 levels in ALI with disease progression. 6A. Mean (± SEM) MMP-8 activity is shown for subjects who developed prolonged ALI (all subjects requiring ventilatory support ≥ 10 days, N=13). With ALI progression, using pooled samples from days ≥ 10, active MMP-8 level increased by approximately 2-fold. > 97% of total MMP-8 found was active in later samples compared to 47% in pooled samples < 10 days. 6B. Active and total MMP-9 levels decreased by approximately 21 and 6-fold respectively with ALI progression [* p < 0.004 for active and † p < 0.0002 for total MMP-9 activity in earlier ALI (days 0-10) compared with later ALI (≥ 10 days)]. In later stages of ALI, > 80% of total MMP-9 detected were present as pro-enzymes. Due to the persistently active MMP-8 phenotype seen in the prolonged ALI group, we examined MMP-8 expression characteristics for each ALI subject over the disease time course (Figures 7A and 7B). Most of the detectable MMP-8 isoforms in the day 0-10 pooled samples was approximately 72 kDa. In contrast, lower molecular weight MMP-8 isoforms (50 and 60 kDa) were detected in the pooled samples from subjects after day 10 of disease. Together, the results indicate that with ALI disease progression, MMP-9 activity decreases while MMP-8 activity remains abnormally elevated, with the emergence of lower molecular weight MMP-8 isoforms. MMP-8 expression shifts to a lower molecular weight isoform in protracted disease. Each lane represents pooled lower airway secretions from a separate ALI subject. ( '+' represents recombinant MMP-8 positive control.) 7A. 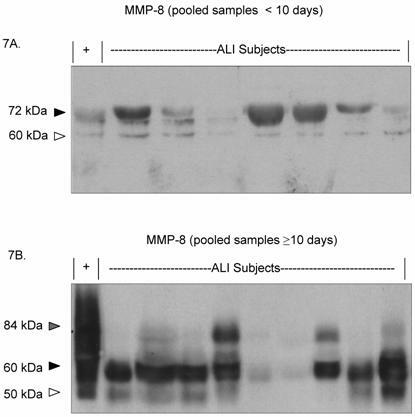 Western blot (7.5% SDS reduced gel) demonstrates prominent MMP-8 staining at approximately 70 kDa (black arrow) in pooled ALI samples from study subjects (< 10 days). Faint MMP-8 staining is seen at a lower molecular weight (60 kDa, white arrow). 7B. Western blot (7.5% SDS reduced gel) shows prominant MMP-8 staining at 60 kDa (black arrow) and 50 kDa (white arrow) in lower airway secretions from later ALI samples (pooled from days ≥ 10). Faint staining is seen at higher molecular weight (84 kDa, grey arrow). Acute lung injury is a clinical and pathological entity characterized by diffuse alveolar-capillary wall damage causing severe impairment in oxygenation (19). MMPs are known to play an important role in inflammation and in extracellular matrix remodeling. This study aimed to assess the pulmonary expression of MMPs and their inhibitors in the clinical course of pediatric ALI, including comparison to healthy controls. Due to a large number of potential MMP substrates and cells of origin in the lung, our initial screening included a comprehensive number of MMP isoforms. From this screen, only MMP-2, -3 -8, -9, -11 and -12 were detected via immunoblotting. Specifically, a robust expression of neutrophil-derived MMPs (MMP-8 and -9) was appreciated in the vast majority of ALI samples. We also found that only TIMP-1 was consistently detected in our ALI samples, with significantly higher MMP-9:TIMP-1 ratios observed relative to controls. Notable differences were seen in MMP-9:TIMP-1 activity ratios of subjects with a prolonged ALI course (ALI ≥ 10 days). Pooled samples from the first 10 days of intubation demonstrated that those with a 'short course' had a 4-fold higher MMP-9:TIMP-1 activity ratio relative to those who went on to have a protracted course (Table 2). Lanchou et al. reported a similar trend with higher MMP-9:TIMP-1 ratios in their ARDS group that rapidly resolved (< 4 days) compared with their more prolonged ARDS group (> 8 days) (11). Another study demonstrated an increase in MMP-9 and NGAL levels (neutrophil gelatinase-B associated lipocalin complex) in lung fluid obtained on postnatal days 2 and 4 from premature infants recovering from RDS, when compared to infants with RDS who went on to develop chronic lung disease (20). These observations suggest that higher levels of total MMP-9 activity and MMP-9:TIMP-1 activity ratios in ALI may potentially serve a protective role and prevent further disease progression. Notable differences were seen in MMP-9 and MMP-8 expression profiles and regulation with ALI progression. MMP-9 activity decreased with disease progression and existed predominantly as pro-enzymes. In contrast, MMP-8 activity remained elevated with ALI persistence, with the emergence of lower molecular weight MMP-8 isoforms (Figure 7B) rather than the neutrophil-derived isoforms seen during the early stages of disease (Figure 2B). Lower molecular weight MMP-8 isoforms are expressed and released by resident mesenchymal cells of the lung (21-22), and secreted promptly into the extracellular space following synthesis (in contrast to the storage and release of MMP-8 from neutrophil granules, where luminal detection predominates (23)). We speculate that in earlier stages of ALI, MMP-9 and -8 are primarily released by activated neutrophils that have entered the pulmonary compartment. With disease progression and reduction in the acute, neutrophil dominated inflammatory response, MMP-9 levels decrease. In contrast to MMP-9, MMP-8 expression remained elevated in subjects with a prolonged course (Figure 6A), and we speculate that this may be due in part to additional release of lower molecular weight active MMP-8 isoforms from resident lung cells (Figure 7B). The failure to detect significant TIMP-2 expression in ALI samples could contribute to the absence of MMP-8 regulation seen in our samples. In an adult study, Prikk et al. identified mesenchymal derived MMP-8 in addition to neutrophil derived MMP-8 in patients with bronchiectasis, which is characterized by chronic inflammation and remodeling of the bronchial architecture (21). Future studies designed to clarify the source of MMP-8 expression in early and late ALI disease will aid in our understanding of MMP contributions to ALI progression and resolution in the pediatric population. ALI secondary to viral infection is much more common in children compared with adults (24). In our studies, we found a trend towards higher MMP-8 and -9 levels in subjects with ALI caused by paramyxovirus-induced respiratory failure compared with non-viral ALI that was not significant. Several investigators have reported a relationship between viral respiratory infection and MMP-9 induction (25-27). Our studies were likely limited by the relatively small number of patients with confirmed viral infection (n=6), but still extend previous reports to pediatric ALI patients, suggesting a positive relationship between viral-induced ALI and MMP-9 activity in human subjects. There are limitations to the current study that should be noted. Our analysis was performed on pooled ALI samples which may prevent direct comparison with other studies that have used samples from different time points in the course of ALI. Because our data demonstrated a natural breakpoint in ALI persistence at days 8-10 (Figure 1), 'short course' and 'prolonged course' ALI were defined for subsequent analysis by this breakpoint. Different studies have used different definitions for early and late ALI, with no clear consensus among investigators (11, 18). Although our choice of 10 days to define 'short ' and 'long' course ALI is seemingly arbitrary, it was naturally defined by our data, and segregated our patients into two groups with large differences in ventilatory requirements. Additionally, due to the small quantities of lung secretions obtained during our studies, extensive analysis for other markers of neutrophil activity and other features of lung inflammation were not performed. Finally, bronchoalveolar lavage fluid was not collected in our study, and therefore direct analysis of the alveolar compartment relative to tracheal-derived secretions was not performed. Despite these limitations, our findings of a limited repertoire of MMP expression, TIMP-1 identification, elevated MMP-9:TIMP-1 activity ratios, and changes in MMP-8 isoform expression over time are in agreement with those reported by several authors, and help to provide a measure of validity to our observations. In summary, we identified a unique repertoire of MMP expression in lung secretions of pediatric ALI patients, with MMP-8 and -9 significantly up-regulated in comparison to controls. In patients with a prolonged ALI course, MMP-9 activity decreased with disease progression, while MMP-8 activity remained abnormally elevated. A shift to lower molecular weight MMP-8 isoforms was detected with ALI progression, potentially identifying a role of mesenchymal derived MMP-8 in prolonged ALI. Our findings lend support to further investigations to clarify the roles of MMPs -8 and -9 on disease manifestations.